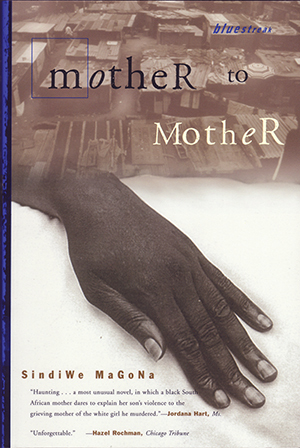 Sindiwe Magona’s novel Mother to Mother explores the South African legacy of apartheid through the lens of a woman who remembers a life marked by oppression and injustice. Magona decided to write this novel when she discovered that Fulbright Scholar Amy Biehl, who had been killed while working to organize the nation’s first ever democratic elections in 1993, died just a few yards away from her own permanent residence in Guguletu, Capetown. She then learned that one of the boys held responsible for the killing was in fact her neighbor’s son. Magona began to imagine how easily it might have been her own son caught up in the wave of violence that day. The book is based on this real-life incident, and takes the form of an epistle to Amy Biehl’s mother. The murderer’s mother, Mandisi, writes about her life, the life of her child, and the colonized society that not only allowed, but perpetuated violence against women and impoverished black South Africans under the reign of apartheid. The result is not an apology for the murder, but a beautifully written exploration of the society that bred such violence. "Haunting . . . a most unusual novel, in which a black South African mother dares to explain her son's violence to the grieving mother of the white girl he murdered." —Jordana Hart, Ms. The text often uses exact dates, times, and locations to separate sections, partially in order to give a sense of history and immediacy. What was your impression of the events and how they are all framed by time. What does in turn say about the writing of history? Do you have memories about the incident involving Amy Beihl and her murder in South Africa? How did you react at that time? Do you feel differently now? The letter to the victim's mother may also be a way to bring about reconciliation, for both sides. Do you believe that reconciliation is possible is such circumstances? Do you know of other cases where a perpetrator or his/her family ask forgiveness or understanding from their victim's family? Is it any different given the specifics of this case? In Chapter 7 (pg. 88-99), the narrator begins to write about her childhood. In her relationship with Stella, her girlfriend, she learns about the township through rumors. How do rumors become another way of telling history and forming communities? What role do the different mothers play in the novel (Mukhulu, Mama, Manono, the victim's mother)? What different commentaries do they make upon the idea of mothering and motherhood? In your life, what has been the traditional role of the mother, and have there been any exceptions (i.e. Mandisi). What role do the different fathers play in the novel (China, Nono, Khaya)? Are there any positive models for men in this novel? What is the role of patriarchy in the townships that Magona depicts? Do you see patriarchy as a dominant presence in your community? Do you see this as a positive or negative aspect of your experience? Central to the controversy surrounding the pregnancy of Mandisi are the ideas of shame, silence, and the power of community over an individual. What role does a community have in the life of an individual, particularly in the case of a woman, her body, and pregnancy in the Black African community Magona describes. How is that different from your own experience. The naming and renaming of Mandisi's child gives insight into the relationship between mothers and their communities. What kind of history is revealed through a name, and what is the history behind your naming. Think about the languages Xhosa (see p. 74 extract, e.g.) and Afrikaans (see p. 86, 3rd line, e.g.) and how they are used in the novel. How did you understand the words, and how did you respond to the repeated use of them throughout the novel? Did you note the difference between the native African sounds of Xhosa and the more familiar, Germanic sound of Afrikaans, which Mandisi and her family use only in addressing authority. Remember that Mandisi's employer refuses to call her by her proper name because she can't manage all the "clicks" in "Mandy's" language. How would you respond to a letter written in the style of Mother to Mother if you had a child killed unjustly? Would you feel a connection to the mother of the killer? Would you be motivated to continue the struggle against racism and colonialism? "The intense cry of sympathy and pain aroused by an all-too-actual tragedy. Sindiwe Magona reminds us of the implacably complex tangle of fury, loathing, innocence, and idealism that ruined two lives and cast a horrific shadow over both of their grieving families. Risky and honest, Mother to Mother raises a host of hard questions and, for all its compassion, resists consoling answers. I admire it immensely." "With Mother to Mother Sindiwe Magona claims for herself a special place, bringing to her first novel the keen intelligence, the verve, the compassion and the stylistic self-assurance that marked her autobiographical writing in For My Children's Children and Forced to Grow, and the crisp sense of character that lent a hard gleam to the stories in Living, Loving and Lying Awake and Push-Push."